Popular blogger Cal Newport reveals the new key to achieving success and true meaning in professional life - the ability to master distraction. Start reading Deep Work: Rules for Focused Success in a Distracted World on your Kindle in under a minute. 5.0 out of 5 starsA manifesto and a how-to in one. Cal Newport delivers. A manifesto and a how-to in one. Cal Newport delivers a stand-out guide for anyone who has struggled with distraction from deep work. Bear in mind, this book isn't for everyone. If you are an academic, writer, or any other kind of deep problem-solver, then big blocks of uninterrupted time for thinking are essential. But this isn't true of all occupations. Some of the guidelines for avoiding distraction will be useful for a wider range of readers, but we should understand that the need for deep work is not uniformly distributed. I got a lot out of this book. If there is one criticism I had, it's that he seems to assume that it's ok for executives to be always "on", available to their teams and the firehose of information. (He is an academic, after all, where you can get away with avoiding admin work as a strategy to increase research output.) But strategic thinking IS deep thinking, and many senior people in public policy, especially, need to find the balance between the always-on mode and the deeper work that brings the analytical insights needed in that realm. People in those positions might want to complement Newport's book with "Paid to Think" by David Goldsmith. 5.0 out of 5 starsThis book really spoke to me. I’m one of those people who is forever tinkering with his work flows, trying to get them just so. 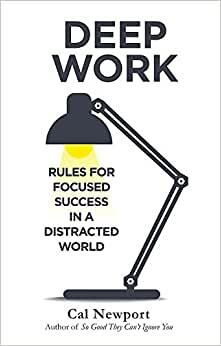 I loved this book because it crystallised a lot of my own partly formed ideas about productivity, creativity and focus. Other reviews have given point by point breakdowns of the content. I’ll just say, I am very grateful for having had the chance to read it. Best self-help book ever. Not because it's inspiring or I want to imitate the feats of the author - but because it just simply works. If you stick to most of the principles in this book you will get stuff achieved and of high quality. Thank you Cal for writing this well-written book. This book forces you to face up to where you spend your time, by distinguishing between deep and shallow work. It gives a range of strategies to facilitate deep work and eschew shallow work. The approach is flexible to suit many different work styles. I’ve take a lot from this book. Well worth the read. Cal Newport makes a clear case as to why we need to learn to work deeply and provides his insights on how to develop this valuable skill. Other reviewers have expounded on its contents. For me, as with all books of this type, the true value is in applying its lessons, seeing what works, and continually improving and refining. For that alone, it is well worth it! 5.0 out of 5 starsA guidebook full of easy to implement steps to improving your Deep Work capacity. Lots of good examples of how others have introduced this Deep Work ethic into their lives. This is definitely a way to get ahead of your peers if you are willing to apply the Deep Work principles with deliberate practice. I personally didn't get a lot out of this book. I think we all know we live distracted lives and that this limits the amount of "deep" work we can do. I think the practices suggested in this book relate to small portion of people who may have the ability to control their daily working routines.